Pala, CA 3/13/10 – The 2010 Pala Raceway Spring GP presented by Summers Bros., UTVUnderground.com, and OffRoadSwapMeet.com turned out to be a HUGE success. With 30 UTV’s staging at the start line for a 3 class land rush start the race proved to be hard, fast, and exciting. The tight enduro styled course took racers from a large open field into the hills of the Pala Indian Reservation and back into an awesome MX styled track. Racers competed in 3 classes ranging from Unlimited, Modified, and Stock. Everything from R1 powered Yamaha Rhinos, to 4 seat family wagons, and professional LOORRS Unlimited UTV’s were lined up side by side for a 45 minute GP race. While the course proved to be much rougher then what most expected it was still a very exciting course. Lots of vehicles fell victim to the Pala rocks. Tires and rims were being ripped apart like rubber balloons and aluminum cans. The racers who finished did it because of smart driving, awesome team support, and lots of luck! While we are still waiting on official results we do know that Brent Fouch in his Kawasaki Teryx took top honors in the Unlimited class followed by Taylor George in the Monster Energy / Funco Kawasaki Teryx normally piloted by Funco family member Chad George. This was Taylor’s first time behind the wheel of this championship winning Teryx and by mid race she was turning off lap times that were as fast and at times faster then our winner Brent Fouch. Brent hasn’t always had the best of luck on the short track in his Teryx but Saturday was his day as he raced a flawless race to take home a dominating win. Brent has moved onto the Super Lite division in the Lucas Oil Off Road Racing Series but will continue to race his #699 Teryx in the Pala GP Series as well as the ITP Series at Lake Elsinore. Summers Bros. awarded 2 sets of their top quality +6 axles to winners in the Unlimited and Stock classes. Jose of Summers Bros. was in attendance and said he was amazed at the turnout. He was pleased to be a part of this event and looks forward to the next round! It was a great weekend, a lot more relaxed the most of the “big” racing series but there was no shortage of excitement and competition. 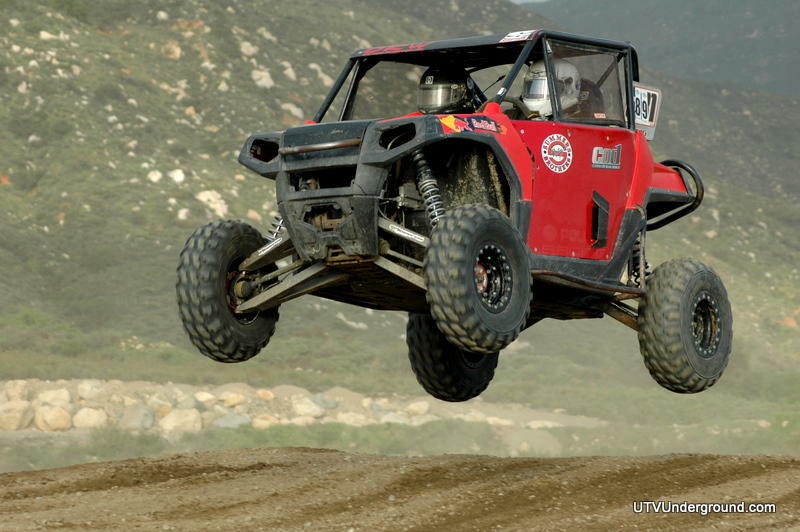 Racers like Doug Mittag with his co-driver RJ Anderson were tearing the track up in first place in the COD “Red Dragon” Polaris RZR until they lost their rear differential mid race due to a large rock that punctured the rear skid plate. 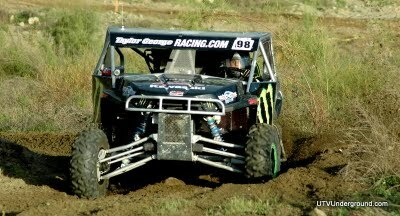 Unlimited UTV racer Tyler Winbury competed in his old super stock Wagon Burner’s Yamaha Rhino and had his little brother co-driving with him. They unfortunately didn’t get to complete a full lap due to motor problems. The Wagon Burners looked like the team of old with 5 UTV’s in competition. They even let Luke Johnson son of superstar MX and Unlimited2 truck racer Ricky Johnson take the wheel of their stock Kawasaki Teryx Pit vehicle. Luke wheeled it in with only a little bit of bumper damage to the stock Teryx which he said was as much fun to race as anything else he drives. Wagon Burners Team Owner, Uncle, Father, Husband, and Friend Pat Winbury said it’s time to upgrade it to a new Funco front bumper! Anyone who has raced UTV’s on the west coast over the last 4 to 5 years knows that Team Wagon Burners on any given race can have upwards of 8 cars racing ranging from Teryx’s, Rhino’s, RZR’s, and Arctic Cats. The Winbury’s have it all. They are one of the first family’s of UTV racing so to see them out at Pala racing together again was a real blast for all of us and we hope to see more of them at future events. Magnum Off Road out of Vista, CA showed up with 4 cars of their own and they were all racing hard until a few had some Pala rocks take them out. Bill Hogan in his Magnum Off Road / Voltage Off Road Lighting Polaris RZR-S has unofficially won the modified class. He drove an awesome race and his RZR-S was in the hunt all day! Dan Fernandez of OffRoadSwapMeet.com came in just behind him in his 4 seat Yamaha Rhino. Fernandez broke a spindle in the practice/parade lap but due to some quick help from 747Ink’s Trevor Smith Dan was able to get his Yamaha Rhino back on the course and into the starting lineup. There are too many stories to tell in one single write up so I will leave it up to the racers themselves to tell their many stories on UTVUnderground.com. It was a great day at Pala Raceway, and it looked like we may have found a series that can fully re kindle the magic so many think we may have lost on the UTV racing front. The entry fees were affordable, the track was an equalizer, and the atmosphere was pure fun! I cant remember the last time I saw a race this large where when it was complete the racers, their friends, and families all stood at the finish line reflecting on their race all together with nothing but smiles across every ones faces.